Following the US president’s Friday speech against Iran and his decision not to endorse the 2015 nuclear deal, members of the P5+1 and several other countries and world organizations voiced their strong support for the deal, known as the Joint Comprehensive Plan of Action (JCPOA). After US President Donald Trump officially announced that he would not recertify that Iran has adhered to the nuclear pact, European Union Foreign Policy Chief Federica Mogherini said the European Union remains committed to the implementation of the agreement on the Iranian nuclear program. “The EU is committed to the continued full and effective implementation of all parts of the JCPOA. The EU underlines that the lifting of nuclear-related sanctions has a positive impact on trade and economic relations with Iran including benefits for the Iranian people. It strengthens cooperation and allows for continuous dialogue with Iran,” EU foreign ministers said in a statement, read out Monday by the EU foreign policy chief. The US president is not in a position to terminate Iran’s nuclear deal with world powers, Mogherini said, stressing that the 2015 accord reached between Iran and Britain, France, Germany, Russia, China as well as the US “does not belong to any single country”. For the European Union, President Trump’s recent decision is an internal US process, she said, adding that the EU would encourage the US to maintain its commitment to the deal and consider its implications for the security of the US, its partners and the region before taking further steps. Mogherini also said that the European Union is not discussing additional sanctions against Iran after Washington’s move. Shortly after Trump’s announcement Friday, the United Nations Spokesman said Secretary-General António Guterres sees the adoption of the 2015 accord on monitoring Iran’s nuclear program as an important breakthrough to consolidate global peace and security. 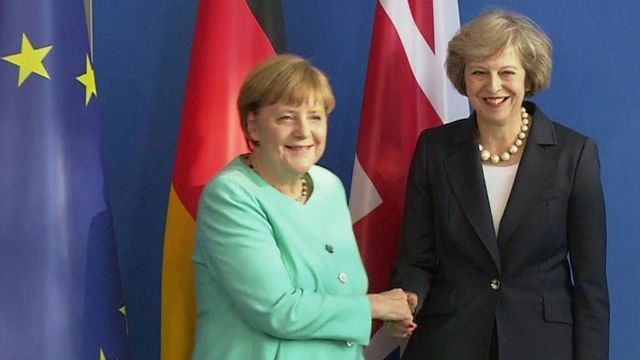 London and Berlin have also reaffirmed their commitment to stick to the 2015 nuclear deal with Iran. 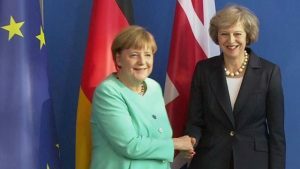 The two countries’ position was affirmed on Sunday at a phone conversation between British Prime Minister Theresa May and German Chancellor Angela Merkel. President Emmanuel Macron also vowed France’s adherence to the nuclear landmark deal saying that it was necessary to have a dialogue with Iran on other strategic issues including Tehran’s role in Syria, where it is backing embattled President Bashar al-Assad. Macron is expected to pay a visit to Iran next year at the invitation of Hassan Rouhani, the Iranian President.